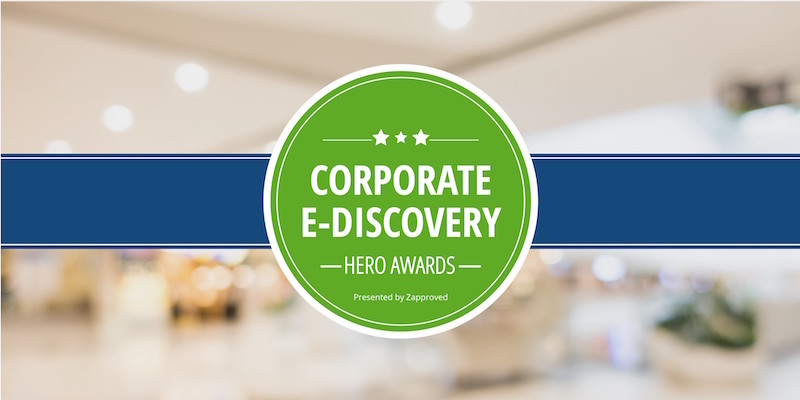 Honoring the e-discovery heroes accomplishing the extraordinary. Strategy - Brett Tarr, Caesar's Entertainment, Inc.
"It was a special evening during which we honored some of the best work by in-house e-discovery professionals. They have made great contributions to their companies for which they deserve recognition, but also are beacons for others to follow. From the sell-out crowd to the luminaries who joined us we couldn't have hoped for a better start for this event that we hope becomes an anchor on the annual calendar," said Brad Harris, Vice President of Product Strategy at Zapproved. During the awards segment, Hon. Shira A. Scheindlin (Ret.) presented Michael Arkfeld with the Lifetime Achievement Award in recognition of his work advancing electronic discovery. Arkfeld, author of the comprehensive treatise Arkfeld on Electronic Discovery and Evidence, is Founder and Director of Education for the eDiscovery Education Center and Director of the Arkfeld eDiscovery and Digital Program at the Sandra Day O'Connor College of Law at Arizona State University. The celebration featured a keynote chat via satellite with NPR's award-winning legal affairs correspondent, Nina Totenberg, moderated by Craig Ball. Totenberg described history-making events that shaped her career, including those involving Anita Hill and Justice Clarence Thomas, J. Edgar Hoover, Ruth Bader Ginsburg and Stradivarius. She also shared insights about President Trump's nomination for the open position on the Supreme Court. Founded in 2008 in Portland, OR, Zapproved Inc. is a pioneer in developing cloud‐based software for corporate legal departments. The Z‐Discovery Platform returns power to in‐house corporate legal teams and helps them navigate electronic discovery with minimal risk and cost, and it sets new standards for scalability and intuitive design. The company's flagship product, Legal Hold Pro, is widely adopted by Fortune 500 and Global 2000 corporations and has earned recognition as the Best E-Discovery Legal Hold Product at the 2015 and 2016 Legaltech News Innovation Awards, Best of the National Law Journal 2014 - 2016. Zapproved was recognized in Deloitte's 2016 Technology Fast 500, the 2014 Inc. 500 as one of the fastest growing private companies in the U.S., and was named as a "vendor to watch" in the 2015 Gartner Magic Quadrant for E‐Discovery. Zapproved is EU-US Privacy Shield certified and is SOC2 ® Type 2 certified which validates that Zapproved's systems have controls in place to protect against unauthorized access (both physical and logical).